The global surgical staplers market is anticipated in a report by Transparency Market Research (TMR) to witness the highly consolidated nature of its vendor landscape. This could be because of the presence of a handful of large-scale private and public medical devices vendors. A few companies based in developed economies are expected to show their dominance over the market. Close to an 80.0% share of the market is held by Johnson & Johnson Services, Inc. and Covidien Plc. However, other prominent names of the market, viz. Grena Ltd., Victor Medical Instruments Co., Ltd., and Purple Surgical International Ltd. could look too improve their presence in the industry. 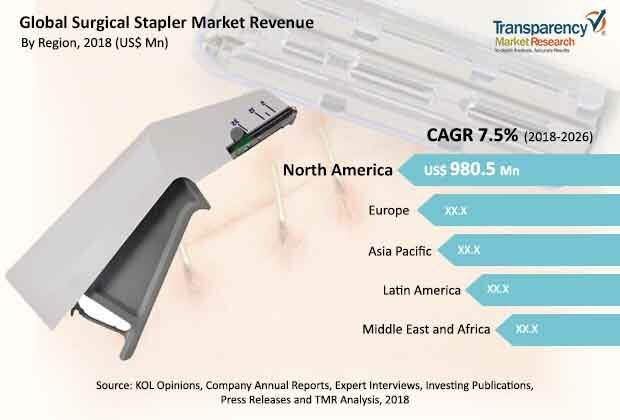 TMR predicts the global surgical staplers market to rise at a 7.5% CAGR between 2018 and 2026 to be valued at a US$4.0 bn by the final forecast year. In 2017, the market gained a valuation of US$2.0 bn. Disposable surgical staplers could take the lead in the market among other products while securing an expected share of 78.0% by the end of 2026. Regionally, North America is foreseen to achieve a larger share of the market, considering its US$0.9 bn revenue earned in 2018. Growing use of surgical staplers in minimally invasive procedures such as flexible endoscopic procedures, general surgeries, laparoscopic procedures, cosmetology procedures, and colorectal surgeries is foretold to push the growth of the market in the near future. Millions of such procedures were conducted in the U.S. in the recent past, according to Ethicon U.S., LLC. Interestingly, these procedures are going to increase in the coming years, as per the findings of the company. The demand for minimally invasive procedures could increase due to the rising awareness about their various advantages, including faster recovery, less pain, reduced risk of infection, and minimal complications. Availability of alternatives to surgical staplers is envisioned to hamper the growth of the market. Another factor that could restrict market growth could be the functional failure of surgical staplers during surgeries. Issues associated with the functionality of surgical staplers such as separated suture lines, misfiring or firing failure, and failure in the formation of staples are projected to impede the growth in demand. Thousands of adverse events due to the use of surgical staplers have been reported in the last five years, according to the FDA. Despite of all these negative factors affecting the rise of the global surgical staplers market, there could be favorable prospects birthing on the back of the growing trend of robotic or computer-assisted minimally invasive surgery. On the other hand, high adoption of such surgeries in medical centers and other facilities is prognosticated to create a whole lot of opportunities in the market.